Before the sequels, before the reboots, before the television shows, the action figures, the video games, and its canonization as a bona fide pop culture icon, Godzilla was just a monster. A lumbering 164-foot tall beast of rage and eradication, Godzilla was the Japanese public’s memories of the horrors of Hiroshima and Nagasaki made manifest in an age when mutually assured destruction between the world’s nuclear superpowers was a genuine threat. In later movies, Godzilla would make friends and allies with both humanity and other giant monsters known as kaijū, the Japanese word for “strange beast,” in his fight against threats both terrestrial and alien, manmade and natural. 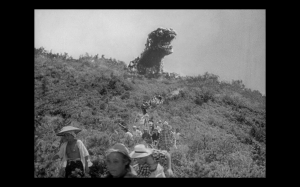 But there was no comprehending or controlling the horror that was the King of the Monsters in his debut film by Ishirō Honda. Though the exact details of his origins have been tweaked multiple times over the decades, the basics have survived relatively unscathed since Godzilla was first released: originally a prehistoric sea monster, it was awakened and empowered by the radiation from nuclear bomb tests. Having gained the powers of regeneration and atomic breath, it cannot be harmed by anything less than nuclear weaponry. It attacks humanity neither as an act of territorial aggression or from the need to feed (Godzilla can absorb and live off radiation). It is simply an avatar of unstoppable, uncontrollable destruction. As the film’s producer Tomoyuki Tanaka explained: “The theme of the film, from the beginning, was the terror of the bomb. 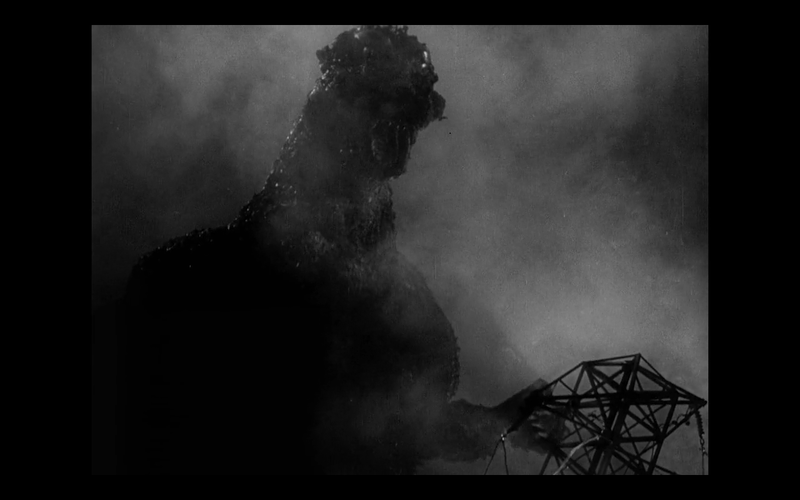 Mankind had created the bomb, and now nature was going to take revenge on mankind.” It is this idea of karmic retribution, of mankind being held accountable for their blasphemous creations, that makes Godzilla more comparable to King Kong (1933) and Frankenstein (1931) than to any of its myriad sequels. But through all of the carnage and metaphors for nuclear annihilation, it is easy to miss that Godzilla has a cautiously optimistic, almost hopeful ending which suggests that if mankind can create its own monsters, then it can also destroy them without losing its humanity. Not so with other monster movies. King Kong is destroyed by the military and Frankenstein’s Monster by a lynch mob. But Godzilla? His destruction is a quiet, almost somber affair where a scientist sacrifices his life to use an invention which, if fallen into the wrong hands, could potentially become as deadly as atomic weaponry. His suicide defeats Godzilla and ensures that nobody else could possibly use his invention for evil. What is Honda trying to say here? Perhaps that science can be both a blessing and a curse depending on how it’s used. Or perhaps Honda is trying to emphasize that mankind’s doom and salvation can be found within itself. 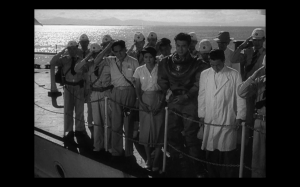 Regardless, there is one inescapable theme in Godzilla: it doesn’t matter how advanced mankind becomes, nature will always be stronger, nature will always keep us accountable for our sins, and nature will always have the final word. Next ArticleTV Review: The Strain 1x4 "It's Not for Everyone"